Brother Holger is a blind Nord Moth Caretaker residing at the Temple of the Ancestor Moths in the Jerall Mountains north of Cheydinhal. During the related quest, Holger will help you by "unlocking" access to the secrets you seek. Together with two other monks, Brother Hjar and Borther Hridi, Holger tends to the silks produced by the Blind Moth Priests in the nearby catacombs. He sleeps in the Monk's Quarters every night between 10pm and 6am. After waking up, he eats a two-hour breakfast then heads up to the Chapel for three hours of silent prayer. After spending three hours in the Quarters he finds the ladder inside the Chapel and spends two hours on the Chapel roof, overlooking the Jerall Mountains. At 4pm, he heads up to the crypt and wanders around in the dark for three hours. At 7pm he returns to the Quarters and at 8pm he enjoys at two-hour dinner before bedtime. After you have convinced him to show you the entrance to the crypt, he will lead you there and unlock the door to the Temple. He is garbed in the traditional white monk robes of the Ancestor Moth, along with a pair of clogs. He carries the key to the Temple and a small amount of gold. During the related quest, you can approach Holger for a bit of help, although he will not speak with anyone while praying in the Chapel. When asked about the blind monks, he will deny any knowledge and when asked about Savilla's Stone, he will say: "Who is this Savilla? A former lover perhaps? I don't know anyone by that name." If you raise his disposition to 70, he will tell you about the stone: "I really shouldn't be telling you this, but I know you are trustworthy. The blind monks in the catacombs guard the stone. It's said to have magical powers. Don't tell Hridi I said anything. I could be banished for telling you." When asked about the location of the catacombs, he will reject you once again: "I can't reveal that! It would be far to dangerous. I don't know you that well." When his disposition is raised to 80, he will agree to help you out: "Okay, okay, I'll show you. But only because you are my dear friend. Follow me. Please be discreet and don't bother the other monks." The small settlement of monks live a peaceful existence, evident by their private conversations; while Holger will ask the other monks, "Are this month's silks ready? ", they will often compliment him on a job well done: "The cemetary [sic] is well tended, brother Holger." and remind him of other duties: "Brother Holger, we need to prepare for the ritual of purity by the next full moon." If he agrees to help after you ask him "Where are the catacombs? ", during the Turning a Blind Eye quest, he replies in a voice more like a beggar's as opposed to his standard Nord voice. 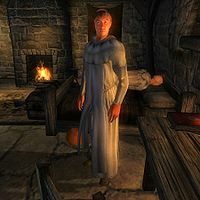 This issue has been addressed by the Unofficial Oblivion Patch; The Xbox 360 version of the line was spoken in a proper Nord voice, albeit the word "you" in the sentence "Okay, okay, I'll show you." was not spoken, hence the re-recording. The UOP, however, implements this fix by taking another line of Nord dialogue and re-purposing it.